Getting a roof replacement is a huge investment in your Denver home, so congratulations! You’re making a great investment, and you’ll reap many benefits of a roof replacement, such as saving on your monthly energy bills and extra protection during inclement weather. Most homes need a new roof anywhere between 15 and 20 years, so this roofing service is almost inevitable as a homeowner and is best done sooner rather than later. In this blog post, we’ll go over five things you should do before committing to a full-on roof replacement. At Endeavor Exteriors, we offer high-quality roof replacement services for residential properties, multi-family properties and commercial properties. We are known in the Denver area and surrounding communities for offering awesome customer service as well as a one-of-a-kind digital roofing experience. Contact us today to get an estimate on our roof replacement services. Not sure if you’re in a situation where a roof replacement is necessary? Check out our recent blog post that explains the common signs that indicate you’re due for a roof replacement. Continue reading below for more information on the five things you should do before replacing your roof! 1. Have a professional inspect your rooftop. Before committing to a roof replacement, it’s important to have a professional roofer inspect and asses the damages on your roof. A few cracked shingles may only require a minor repair service, but if your roof is in absolute shambles, a roof replacement will obviously be the right call. Either way, a licensed and insured roofer can give you a better idea of whether or not you need a replacement over a repair. 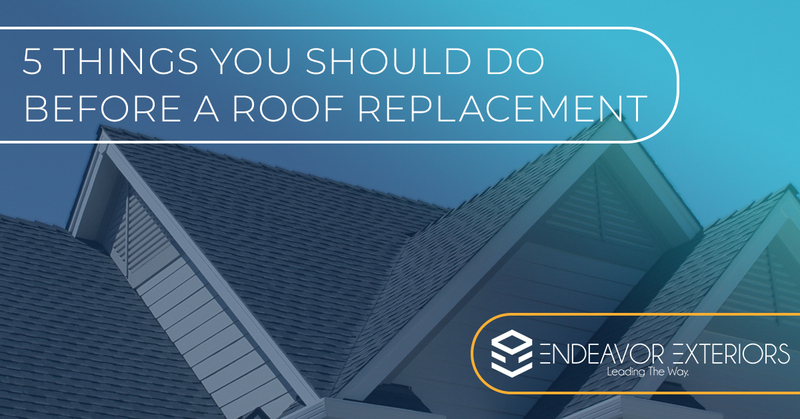 Also, if you’re opting to replace your roof by choice rather than dire necessity, knowing the current condition of your roof is essential. You’ll have the ability to hold your roofing company accountable, and you won’t be in the dark when it comes to any potential issues on your roof. 2. Give your insurance company a call. It boils down to this: unless your roof was affected by unexpected inclement weather, like a hail storm or hurricane, your insurance company won’t help you out with the cost of your roof replacement. However, also keep in mind that insurance companies/policies can offer cost reductions to homeowners for routine maintenance services. If your insurance company does this, we recommend reaching out to your insurance company to inform them that you are having a new roof professionally installed. This way, they might be able to offer you some sort of rebate or another financial incentive to start regular maintenance on it. You never know what you might be missing out on unless you ask! If your roof was totaled by a weather-related condition and you believe your roof replacement should be funded by your insurance, learn more about how to file an insurance claim with your insurance provider here. 3. Do your research on different roofing options. You want to choose a roof that will be sturdy, energy efficient, functional and beautiful. Of course, depending on the type of roofing material you choose, you’ll have different price tag options. Asphalt shingles are durable and are usually your most affordable option, whereas concrete tile looks more aesthetically appealing. Research the benefits of multiple roofing materials, and double check to ensure whatever you choose aligns with your HOA requirements (if applicable). Figure out what you want your roof to look like, and from there, it’ll be easier to determine the best roofing option for you. Are you the indecisive type? At Endeavor Exteriors, we have innovative technology that allows you to see a 3D rendering of your home so you can try out different roof materials and colors. Learn more by giving our team a call today! Pro tip: Use this time to think about other roof installations you may be interested in, such as solar panels. Since you’ll be getting your roof replaced anyways, you might as well knock out several services at once for ultimate convenience! Getting a roof replacement takes time. This roofing service comes with a lot of early mornings and later afternoons, and it can be rather loud when roofers are hammering away at your rooftop. If you’re able to plan for your roof replacement, you want to ensure you’re properly prepared and that you have the time for this type of roofing service. 5. Choose the best roofing company for the job. You want a trusted, reliable roofing company to handle any of your roofing services. Browse online reviews and get referrals from friends, family, businesses or online sources. Endeavor Exteriors is properly licensed and insured, and we take pride in our roof replacement services. We can get the job done correctly and on time, and our job isn’t done until you are 100 percent satisfied with our work. For tips on finding the best roofing contractor in Denver, learn more here. We aren’t your grandpa’s roofer. At Endeavor Exteriors, we provide our customers with a new-age, digital experience that prioritizes transparency, technology and communication. Our goal is to change the exterior restoration industry for the better, and we do that by providing our clients with not only excellent roof replacement services, but also exceptional and unrivaled customer service. With more than 75 years of combined experience under our belts, we know what it takes to get your roofing project done efficiently and with ease. Choose our team for your next home improvement project. Contact us today to schedule an appointment with our roofing staff by calling (720) 464-3472 or completing our contact form online.